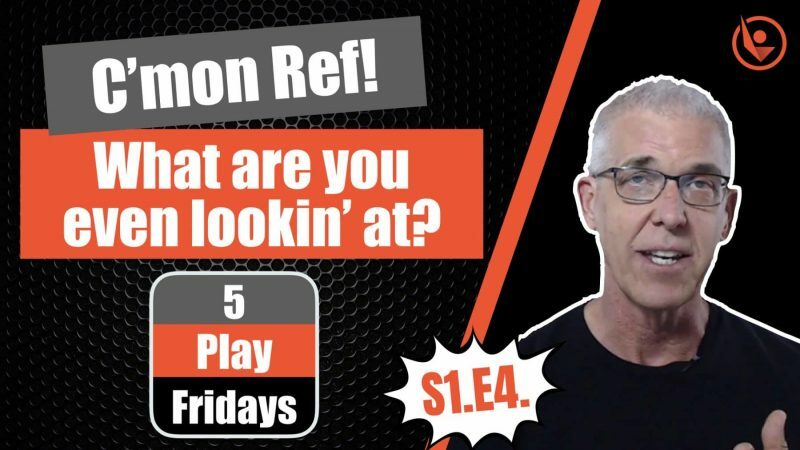 5 Play Fridays – S1 E4 – Hey Ref! What are you even looking at? 5 Play Fridays – S1 E3 – Hey Ref! What are you even looking at? our emphasis today is understanding which players we are officiating, what our primary responsibilities are and staying connected to plays as Trail. not giving up on them. Lead official is responsible for the secondary defender. he’s officiating this play for a possible block charge, for absence of verdict verticality, or for elbow contact here. the Trail official is responsible for the primary defender on the play. the primary defender is red 1 and needs to stay with the play and get this push by red 1 on our airborne shooter. we’re dividing the responsibilities of a who’s officiating what. Lead is responsible for secondary defender on a drive to the lane the Trail needs to stay connected on the primary defender and also ready to make any calls on obvious fouls in their secondary. so the primary focus of this play is staying connected as Trail but having discipline as a crew. recognizing who is officiating what. play down the lane secondary defender belongs to the Lead. Lead has first crack in their primary coverage area. Trail official has this player primary defender. we could from the Trail I have a reach-in by this player here but this block charge play belongs to the Lead. Pass and crash play offensive foul by Lead. The defender establishes legal guarding position prior to the player going airborne. notice the shoulder turn. is that a factor on this play? not by rule. oftentimes a cue that our brain receives and our brain says “oh wait a minute he did something. he’s therefore illegal.” A defender is allowed to turn to avoid contact. offensive foul. this is a crew discipline play. super easy charge call. this play completely belongs to the Lead. On a fast-break all defenders our secondary Lead has first crack. in case of a double whistle we want our mechanics to be clean fist up confirm then signal especially as the outside official we don’t want to give a preliminary signal when the play is not in your primary. connected as Trail. primary defender is beaten. we need to stay with this play. this defender belongs to the Lead the secondary defender but the Trail needs to stay connected and have the backside defender. that’s illegal contact. that’s a foul. that’s a shooting foul. Here is a fun play to end on. Who doesn’t like the 3/4 court shot? Big court as well. Even in a fun play like this there’s something for us to focus on. the gym’s excited. everybody’s excited. is the team that just got scored upon excited? At the end of a period and during timeouts we need to observe the players crossing. This has to be a habit. We can’t be focused on our mechanics and scoring goals and things like that. We must observe the players! In this instance the player throws the ball to the Lead. If it was at all inconvenient, just let the ball go. Watching the players is more important. The players back here are all good. The main concern for me on this play is number 30. His demeanor is not happy. He’s going right into the black team as they are coming off the bench. It’s not impossible to imagine a scenario where somebody gets shoved here or a word is said or something else. We just have to know what’s happening on the play we have to know right close in observe. Check last week’s episode here. 5 Play Fridays – S1 E3 – 5 Plays to help basketball referees be a better official. welcome to another edition of 5 play Fridays where we look at plays and see what we can take from them so that we can get better as basketball officials. 5 play Fridays is weekly series with new videos releasing every Friday during the basketball season. make sure to hit subscribe and also the notification bell so you don’t miss out on any of our new videos. now let’s look at plays the point of this play is to recognize whether or not we have a shooting foul if you are inclined to say this is not a shooting foul I encourage you to check the action on the play and get a clearer understanding of when the habitual throwing motion begins. basically the shooting motion by the player. this is a ball handler dribbler she is dribbling the ball she picks up the ball. the foul has not yet occurred. the foul occurs with the hip check right here. that drives the player off their line. this is absolutely a shooting foul and the player should be awarded two free-throws. right here she’s a dribbler. she has begun her habitual throwing motion here. the foul occurs here when the player extends her hips. trail official. primary defender. open look. foul that’s a shooting foul two free-throws awarded. Our point of emphasis from NFHS is more accurate travel rulings and they do achieve that accuracy let’s focus on finding the pivot foot and knowing the rules and restrictions. basketball referee play review helps us in this process. National Federation of high school point of emphasis for 2018 one of them is guarding and verticality plays we’re judging the verticality the legality of the defender on this play what we’re trying to determine is whether they go from point A to point B or whether they go straight up we’ve got an airborne shooter defensive player jumps from here contacts the airborne player certainly has his hands up in the air and we need to judge the validity this play obviously belongs to the lead that’s their primary coverage area for watching the play here we’re seeing where everybody’s looking in good position as a crew centers in great spot trails in a great spot we had a lot of action between the lead and the trail then we have a sudden drive down the lane contact tough for the trail to help on this play Center has a great look at a secondary coverage play but we’ve got no call on the clearly comes into an offensive player that’s a defensive foul so again that’s a foul one of the points of emphasis last year was illegal contact with the lower body defenders learning to play with their hands up but using other tactics right this is a play where the defender yeah he’s got his arms straight up but the body contact is the foul. 5 Play Fridays – S1 E2 – 5 Plays to help basketball referees be a better official. Today as we do basketball referee play review, we’re going to focus on two of the NFHS points of emphasis for 2018. we’ll start with two plays that involve traveling and then two plays that involve block/charge and guarding. Stick around for play number 5 as I guarantee it will be a challenge for you as a basketball official. let’s get started. As we recall from the points of emphasis video for 2018, NFHS says not that there’s TOO MUCH traveling being called not that there’s TOO LITTLE traveling being called but rather the accuracy of traveling calls needs improvement and the way to improve our accuracy is to first identify the pivot foot. Subscribe to our YouTube channel here. More basketball referee play review with this step-back play popularized by James Harden in the NBA among others. It is definitely being taught to kids today, so it’s something we have to learn to officiate. The player terminates his dribble with a right foot pivot foot. He uses the right foot to push his body away from the defender and creates space for an open shot. This is all well and good. The problem is he comes with a staggered landing landing: one foot two foot. By rule that is a traveling violation. What he’s trying to do is execute the move from our points of emphasis video. He jumps off one foot holding the ball but lands with two feet simultaneously. This is the key. that’s a legal play. and that’s what these players would the step-back move are trying to accomplish. as officials we have to judge whether they achieve it successfully or not. To reiterate: jump off of one foot land on two feet simultaneously is a legal play. jump off one foot land with a staggered landing with two feet is an illegal play. Basketball referee play review of traveling now looks at when small quick players execute this move sometimes it can be a challenge for us to sort out in our brain which foot was the pivot foot things happen very quickly in this instance we’ve got a larger more lumbering player which makes things a lot more evident let’s find the pivot foot that’s our objective right here so we’ve got a left foot pivot steps forward or the left foot gathers the ball holds the ball spins places the right foot on the floor as well as the left foot back onto the floor this is a traveling violation left foot left foot returns traveling. Defender two feet on the floor facing his opponent torso contact charge one of our fundamental principles on a transition play is to be always ball aware we know what’s going on with the ball but also what’s going on with our crew right has there been a rotation that we missed etc on this play if you’re the center you need to be aware that your lead official is not in a great position for whatever reason he’s not in a great position I have that awareness that’s a foul secondary cadence come in put a whistle on the play let’s make the spot move to the reporting area and off we go transition play all defenders are secondary defenders basically these two either play involving news these two defenders belongs to the lead lead as first crack the lead is out of position or that’s a play that needs a whistle secondary cadence from an official who’s the play is in there secondary. In a fast-break situation all defenders are secondary defenders. these two defenders here are secondary defenders. lead has first crack on secondary defenders. we have a charge. let’s talk about the legality of the player. prior to going airborne both feet on the floor facing his opponent. easy charge. this defender is legal. now we have players on the floor and we have players coming in to assist. do not run away from these plays. we’re in no rush. no we have a charge on white 32. We know where we’re gonna go. let’s just make sure everybody’s in great shape. yes players are good. NFHS mechanics when they make the call as the lead is going to switch with the table side official. if the lead had properly designated the spot as over here on the O he would become the new lead table side. fails to do so on this play though. move to the reporting area. report and off we go. it’s important to recognize whose defender this is this is a secondary defender on a fast-break situation belongs to the lead. Lead is not in perfect position here but easy easy call. if the lead does not have a call who can get it? Center can get it. trail can get it. now we’ve got players on the floor we also have two officials moving. official one official to both moving that means your third official has to observe the players. Before we look at play number five it’s important to remember that blue fifty-five and white 34 had been an issue for us the entire game white 34 and blue fifty-five have been our trouble players the last foul on blue was their seventh team foul we have us as a crew have to figure out whether this is a correctable error and if it is how we’ll proceed that’s the challenge for you right now is to say I’m gonna pause the video and I’m gonna answer these questions: did this occur in the correctable time frame? how will we resume? Did this occur in the correctable time frame? How will we resume? the challenges we face in correctable error situations is we have to rewind the game in our mind and piece things together as a crew. what happened? can we fix it? how will we proceed? in this instance what we need to do is realize we erroneously awarded the white team a throw in when they should have shot merited free-throws. this is when our period starts we have until the ball becomes live again to correct the error. we have a foul and the ball becomes dead. so at this point we are informed by the table that the last team foul was the seventh. since the ball has yet to become live since we made the error it is within the correctable error time frame. the next thing we need to determine is has there been a change of possession. recall that we gave the ball to white for a throw in. since that time has blue had possession of the ball? the answer is obviously yes since they took the rebound and went the length of the floor and shot and for the goal. we know that when we award the merited free-throws in this correctable error situation it will be with the lane cleared. we’re not going to resume the game with the merited free-throws since we’ve had that change of possession. we are going to resume with blue shooting the free throw that they are merited here but before we do that we’re going to correct our error by awarding the merited free-throws for white at the other end. basics. good. now who shoots the one in one? Who shoots the one in one? our player who was fouled is white 13. white 13 is going to shoot the free throws except white 13 is now subbed out of the ballgame! We’re informed so you could make a case hey even though he’s been subbed out and cannot play until the clock runs you could say well this timeframe is such that we’re gonna bring white 13 back and he’s going to shoot the free throws but what if prior to the original throw in white 13 had been substituted for then who’s going to shoot the free throws something to think about. Our takeaway on the correctable error play is first of all we’re concentrating on the game itself we have players in the game who we are keeping an eye on we have situations we’re aware of the calls our partners have we’re working as a crew we’re very occupied with the game and then suddenly we’re presented with a correctable error situation. It’s not always easy for us to just say oh here’s what happened let’s do: this, this, this, this, this. It may be a situation where we have to replay let’s say originally blue a white misses the shot blue comes down misses a shot comes down to the other end white misses a shot etc it goes down back and forth for three or four times we have to in our minds as a crew reconstruct what has happened to determine if there’s a correctable error time frame that we can correct this error and how we’ll proceed it’s not easy but it is something we have to be prepared to do. in high school they have correctable errors situations. Just saying well I’m not gonna let it happen in my game a lot of ways is a cop-out. “I don’t need to think through how to actually solve the problem because I’m gonna prevent the problem!” Any way that you slice it, the problem will arise and we need to learn how to officiate these plays. Basketball referee play review complete! 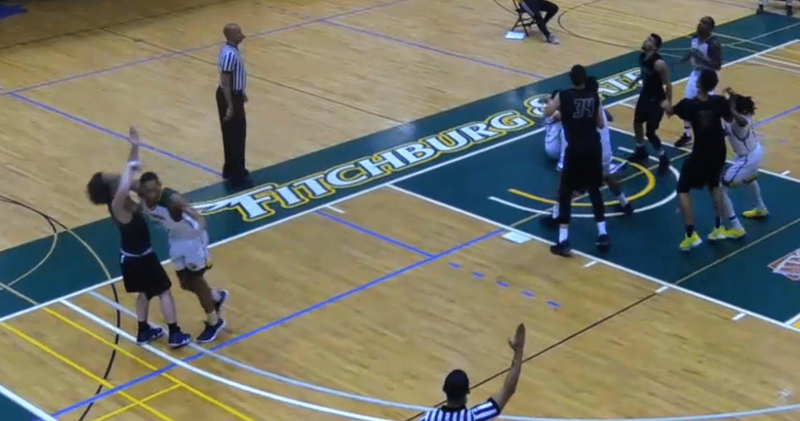 The viral video of the flagrant foul committed by a Fitchburg State player in the basketball game has been viewed by millions. From the cropped view there is an impression that the referees on the game were lacking. The full video shows clearly that that was not the case. The officials handled the play and the aftermath very well on the play that led to the Fitchburg State player being ejected. From a basketball official’s perspective, the Flagrant Foul Basketball Video provides us all a chance to get better. Here is our analysis of the Flagrant Foul Basketball Video with Fitchburg State player being ejected. Whoa what time is it? It’s time to look at plays! Hi everybody it’s Greg with abetterofficial.com where we craft video to help basketball officials get better and to take control of their officiating career. Throughout the season we will be having play review. We are going to start with this play here. I’m fairly certain most people have seen the play. It is all over instagram, twitter, facebook, and the news. A heinous act. No place in the game for this kind of activity obviously. We are going to look at the play and see what we can learn from it. Not from the short, cropped view that kind of gives the impression the officials were inattentive, but the larger view that tells the full story. We are just going to take a look and see what the crew did, and how we may be able to do better the next time we have a similar scenario. Here is our scenario: it’s a 10 point game. 3 minutes remaining in the game. The offending player on the flagrant foul apparently has a technical foul previously in the game. These are the variables that we know. Positioning by the crew fantastic. Trail is working low with a non-competitive matchup. This is all good. Center receives the play and has an excellent look on the play. Lead initiates rotation but let’s watch the center official. How are we describing this look? Can we see the feet of the players? Can we see what that swipe? Whether it produce contact? The answer is no. We have accepted something less than an open look on the play. Transition. We have a block charge scenario: a pass and crash in the lane deemed incidental. On that little cropped video from instagram it looks like maybe our trail official is inattentive on this play. No, he is all over this play. Clear. Upgrade. Flagrant. We haven’t tossed the player yet. Let’s look at the positioning as a crew on the initial play. We have a lead in great shape. Center is in great shape. We have this potential pass crash in the lane that is going to draw the attention. The lead official it comes to a pinched position as he should on this play. Incidental contact is ruled. We have a player running at a three-point shooter, something we always have to be aware of. Oftentimes players don’t have body control etc. We need to stay with our shooters. Wow. Horrible. Horrible. We are going to: mark, score, foul. No doubt. Good. Now we are going to get together as a crew. Whenever we have atypical plays that we are going to have upgrade and possible consequences. This crew does not have a monitor available to them. It’s a lot like high school. All that we have is the information we have between the officials and our officiating crew. We are going to have a conference about this play and determine exactly what we have. Our first order of business is to send the teams to their benches. Let’s get them in their bench areas that we don’t have to deal with them anymore. This crew doesn’t do that super effectively. Again, we are looking for things that we can take away for in our game let’s get the teams to their benches. We can talk together as a crew. The crew has the ball and this is good. Also, we have a ruling on the floor this is good. And we are going to confer. We have an assistant coach approaching. No. We are going to come up with a ruling which is fantastic, but let’s get these players here back to their bench area we don’t have to worry about them leaking in or listening in or whatever. Let’s take our meeting as a crew to the division line because what’s going to happen next? We are going to get coaches together. Where are we going to get them together? We are going to get them together at the division line. Let’s just think through the scenario so that we when we were confronted with it we can do a better job. The officials confer. Here’s what i’d want from my crew. I want us all involved. We have a third official not involved. I assume the taller official is the crew chief on the game. That’s an assumption on my part. I want to have a conference between the three of us. We need to understand exactly what we have because we have had possible dead ball contact. That may be something different like in a high school game. If the ball had entered the basket we have dead ball contact. That would be a technical foul not a personal foul. In this instance, obviously, we had contact that is violent or savage in nature. As a result, we definitely have a flagrant foul. But on atypical plays we have variables that we need to piece together as a crew. So, we shouldn’t rush over small details. We are going to cover all the factors of the play because we want our ruling to be 100% accurate. What is the ruling? How we are going to administer the penalty? How we are going to resume play? These are the variables we need to determine, and we have the best chance of getting the play right if we have all 3 officials contributing. We have an official putting his arm around the other official. I’m not a big fan of this. I don’t like it. I don’t like the the optics. The way that we are working here as a crew I’d prefer that we were at the division line and we were having a conversation between all officials and it was between peers. All equal. We have an extended conversation. Again we are managing players. So, let’s get them into their bench area to start and nobody’s leaving until we are done until we have a ruling. We have a ruling and we are going to present it to the coaches. But what’s missing? What is mission is we are missing the calling official! The Crew Chief on the game is going tableside to confer with coaches. Fantastic. Also, let’s have a second official over so we have a witness. We know how the conversation went. Who said what etc. We want to communicate the ruling to the coaches with the calling official present. There are so many takeaways from this play. Rewind to the no call at the other end preceding the flagrant foul. Let’s go back to the center position on the missed foul on the possible contact on the elbow. I want to compare that to another play that was viral for other reasons. A play with james harden. People considering it a travel. Is this a travel? People love to pick apart traveling in the NBA. NBA has different traveling rules than us at lower levels. It’s always fascinating. The thing about this clip is not whether it’s traveling or not, it’s the positioning of the center /new trail official. Let’s take a look at that. This is phenomenal display. A textbook approach to a play like this. Hardin moves and the official knows to keep an open look he has got to get lower and lower still. He checks the feet for the three-point line, then he looks up top for elbow contact. He looks at the feet to see if there’s the lower body contact by the defender. Then and only then we are going to mark the three-pointer but scoring the three-pointer is not our number one objective. Officiating the play is our number one objective. We have got other officials to help us if the ball goes in the basket etc. A phenomenal display of how you’d want to act as the center or as the trail in this play by absolutely being committed to an open look and doing your job: Job one, Job two, Job three. We are evaluating all of these components of this play, just a fantastic example. If we go back and look at the previous play that was missing. Bottom line that was missing. Nothing about the body language of the official said that they were motivated, at all costs, to get an open look on the play. When we analyze our game video and we are looking at our positioning. Officials can’t always get the best look that’s a given. We try to anticipate and we try to be in position etc. When we don’t have a look we need to see a body language from the official that is ‘high alert!’ I’m out of position but I’m fighting. I’m fighting for that open look. Because I’m committed to it, because obviously having an open look on plays is the number one factor in call accuracy. Basketball Referee get your game video! Basketball Referee get your game video! The number one tool for rapid improvement as a basketball official is breaking down and analyzing game video. The first step in that process is getting your game video. That’s what we’re going to cover today. It’s important to understand have a mindset that every single game that you’ve worked in the high school season is on video and that that video is online. You just need a link! Coaches in the San Francisco Bay Area use Hudl Krossover or YouTube online video services which their games are posted to. We need to get a link of that video! This is a simple process, but takes a little detective work. Unlike preparing DVD mailers to provide to coaches, there’s no cost to us involved. all i need to do is invest some time. i need to invest time in order to get my game video. The first step in the process is I need the coach’s email addresses. These are almost always available online. We just need to do some detective work. Ninety-five percent of all the games you work you’re going to work games for coaches whose email addresses are on the school website. Let’s go garner that information and then we’re going to send them an email. the email process of course has no cost. With a DVD we don’t have that connection. i’ve handed out a DVD i just have to wait and hope. when I email the video request I have more power in the arrangement. Online video is going to offer me higher quality video for downloading almost always. it’s easily shareable I can share links to my partners on the game and this is very important as well. What I’m going to do is I’m going to put that into my contacts so that the next time I have a game for that coach I won’t have to do the research all over again so in gmail contacts I have the coach use a little coding so that if I know the school name I can just enter that don’t have to remember the coach’s name. find the opponent in the game granada drill down they have a coaches tab find the coach in question is the same nomenclature to enter the info. Now we need to compose an email. try to provide as much detail as possible about the opponent and the date and do that accurately so we want to make it as easy as possible for them to reply so they get the email they say the game on the 17th they can go to their Hudl, Krossover or YouTube account and quickly and easily forward us the game link. when we get a YouTube link, of course, we’re going to have to go through some sort of downloading software to download a youtube link. Krossover it’s usually just sent as a link like this very straightforward click brings up the video and then we just click the download link here and we’re good to go. all right there you have it we’ve given you the tools to contact coaches and get video links sent to you here’s the fantastic news starting today you can go back retroactively for the current basketball season and email coaches for video. you’d be surprised how quickly you will get video of your game so we have to invest time to go get the email addresses etc. I challenge you today if you haven’t already done so go back to the games from one month ago start their league games email the coaches requesting a link. we’re requesting a link from both coaches. Our chance of return is fantastic you will get videos of your games almost immediately. One of the keys is be professional. it’s just a professional courtesy it’s just business don’t engage with the coach about the quality of officiating on the game your partner or set anything. all I’m requesting is link to the video of the game: coach, we use video to improve as officials and it’s really important to us if you could send us a link that would be fantastic. alright I hope you take this information to heart and you take action immediately. all right thanks again thanks for watching five minutes on officiating.